As the last chapter established, pro-suffrage women had begun to begin a new phase in the struggle, even if many issues concerning the nature of female relationships with the media and how they were manifested had yet to be resolved. 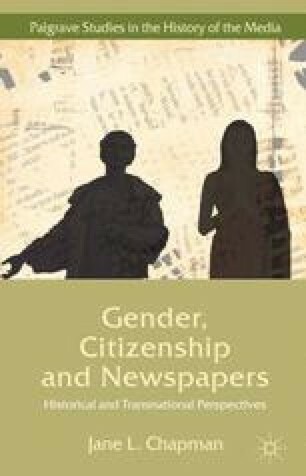 This was part of the mobile process of cultural citizenship, although definitions of the concept were still opaque and the tensions first identified in the 1860s in France, in relation to the potential clash between ‘conservative feminization’ and emerging female citizenship of a more political nature, were still present. Despite, or maybe because of this, women’s public profile as mediated by mainstream newspapers, influenced in turn by the movement’s own press, was taking a giant step forward with the campaign in Britain for the vote.